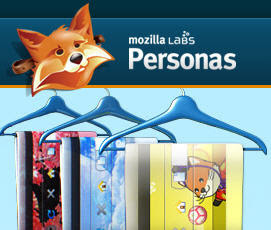 I just noticed Firefox Personas this morning. Since it takes me a while to actually wake up, I decided to play around with it while rubbing the sand out of my eyes. It let's you spice up your browser with a skin, just like Winamp used to let you do (is that even around anymore?). Every once in a while I do get sick of the status quo so this is a nice change. I imagine it's pretty easy to create your own skin, though I haven't really looked into it. It seems like it's just an image file. But there are plenty to choose from that other bored people have already made.